The For Beginners series of graphic nonfiction books take on complicated subjects in an authoritative but accessible and entertaining manner. The titles in the series run the gamut from Art History for Beginners to Relativity and Quantum Physics for Beginners. Readers can now add Prison Industrial Complex for Beginners to the list of available titles. 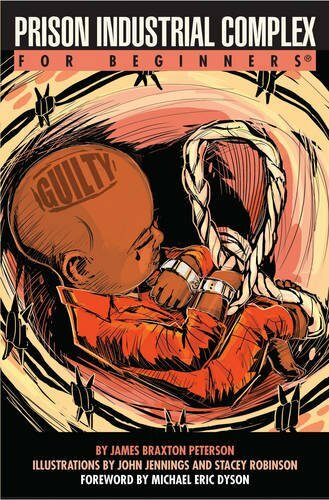 Written by Director of African Studies at Lehigh University and prominent media commentator James Braxton Peterson, Prison Industrial Complex for Beginners traces the roots of the insidious monster that is the American criminal justice and mass incarceration system—what Peterson refers to as the Prison Industrial Complex. At the outset of the book, Peterson posits the question: Why are we the Incarceration Nation? Why does the United States imprison huge swaths of its population, and why are the imprisoned so disproportionately black? Scholars and researchers have long considered these questions, and reams of data exist from which to extrapolate answers. True to its title, however, Prison Industrial Complex for Beginners goes far in deconstructing the complex, social, political, and cultural developments that are the basis for the Prison Industrial Complex. Slavery was the first massive imprisonment of black men in America. While slavery was outlawed by the 13th Amendment, an exception allows for legal slavery "as a punishment for crime whereof the party shall have been duly convicted." From "Black Codes" used in the South to control blacks, to modern law and order politics and mandatory minimums, Peterson argues that the Prison Industrial Complex is, at its core, a deeply entrenched form of cultural racism. The American Incarceration Nation did not spring up out of nowhere, of course. Throughout the text, Peterson closely examines two fundamental facets of human nature that are significant driving forces behind the Prison Industrial Complex: fear and greed. "The fear of crime, especially violent crime, has tremendous political and economic capital in the United States," writes Peterson. Fear is, of course, subject to the powerful forces of propaganda. Peterson theorizes that political and media propaganda efforts have contributed mightily to the development of the Prison Industrial Complex. Bogus concepts such as gangs of roving "superpredators" and murderous drug addicts have fed the fire. And destroyed lives. Peterson also ties the development of the Prison Industrial Complex to the involvement of private industry, noting that "American private industry has viewed the prison system as a viable opportunity for economic investment and exploitation—especially the potential for cheap, unregulated labor." From the days of convict leasing to the modern privatization of entire prison systems, huge sums have been made in the ethically repugnant business of human warehousing. The numbers are eye opening. Telecom services alone generate $1.2 billion in private revenue annually. The two largest private prison corporations, Corrections Corporation of America (CCA) and GEO Group combined to generate over $3 billion in revenue per year between 1990 and 2009. And private prison companies donate tens of millions of dollars annually to political candidates who support policies that will deliver more units (people) to their prisons. Peterson also makes the case that the Prison Industrial Complex grows by feeding off of itself. Education and rehabilitation efforts have been abandoned, and the incarcerated are prepared for nothing other than a future return to prison. Probation and parole officers no longer focus on keeping their charges out of prison, but increasingly use technical violations to return them to prison. High recidivism rates are the proof in the pudding: Modern American incarceration is about nothing more than the cyclical warehousing of human beings. Peterson's exposition of the state of the modern Prison Industrial Complex is troubling. What is necessary to begin dismantling the behemoth is daunting and would require a seismic shift in the thinking of American citizens and politicians. Peterson cites reform proposals, such as revisions to sentencing laws, abandoning failed policies (such as the War on Drugs), and even the abolition of the mass incarceration system altogether. These are tall orders. Can this even be said?